On 12 December 2018, Team Antigua Island Girls set off on the Talisker Whisky Atlantic Challenge 2018, a crossing of the Atlantic from La Gomera in the Canaries to English Harbour on the island of Antigua in the north-eastern Caribbean. They are one among 28 rowing boats in the event, crews of solo rowers, pairs, three, fours and even fives. The crossing is approximately 3000 miles and teams are expected to take between 30 and 75 days to complete the distance. 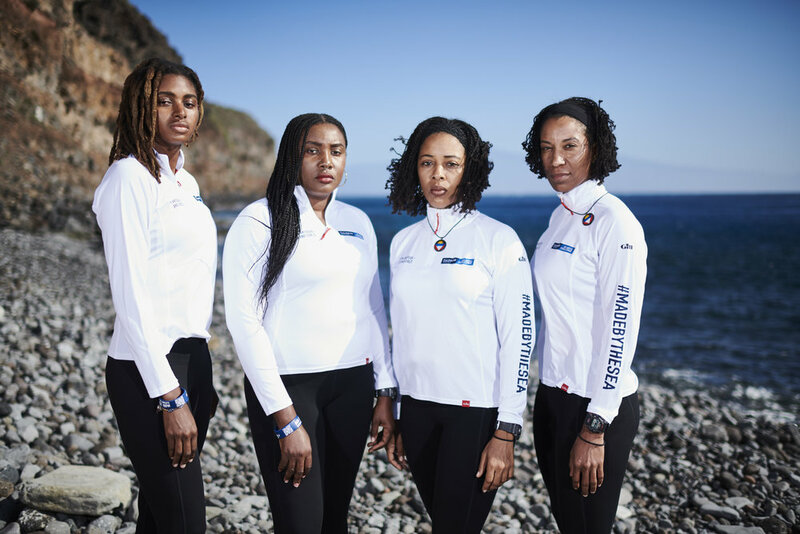 As their name implies, the four rowers of Team Antigua Island Girls are from Antigua: they are Kevinia Francis, 40, Christal Clashing, 29, Samara Emmanuel, 32 and Elvira Bell, 37. They have been training since early in 2018 and did not know one another before the team got together. This is the first time that any of them have attempted such a huge challenge, but they are gunning for several firsts, including first all-black team to complete the race and first all-female team from Antigua . They are also raising money for Cottage of Hope, a charity that works in aid of disadvantaged children in St Johns, the Antiguan capital. Their progress can be followed at the live tracker at the Talisker Whisky Altantic Challenge website. Is this a first, or have you done this sort of thing before? Kevinia: For all of us, the Talisker Whisky Atlantic Challenge is our first time rowing. We only started to learn during our training so just being here is an achievement. Samara has previously done a lot of sailing and we’ll benefit from her nautical knowledge so that’s a great skill to have within the team. All: Successfully row the Atlantic in the 2019/20 race! Elvira: It’s only been since earlier this year that we realised that we were strong enough to be a part of the 2018/19 fleet. We’ve come a long way in a short space of time. Samara: It’s also an opportunity to raise a lot of money for the charity Cottage of Hope. How did you come across the event? Kevinia: The Antiguan Government put a call out looking for a team of rowers to do the race, and they were specifically looking for females. We all applied separately without knowing each other. Christal: There’s been two Antiguan teams in previous years so we’re following in their footsteps. But at the same time, we’re going to be creating a new path - we’ll be the first all-black team to take part in the race, the first all-black team to row the Atlantic, and the first all-female team from Antigua. Christal: They are all really supportive, but for each of us, taking up a challenge like this is not completely out of character, so in some ways many of our friends and family kind of expected it. What sort of training have you done? Samara: Once a week we’ve been out on the water and we’ve been practicing doing long rows of a minimum of 8 hours at least once a month. Kevinia: Then around 5 or 6 days a week we’re in the gym training, doing weights and just preparing our bodies as best we can. Elvira: We’ve also done a lot of mediation for mental preparation and tried to learn techniques and skills that will help us keep focus but also to re-gain focus when we need to dig deep. Christal: We’ve been able to have the added bonus of training a lot in the kind of environments out at sea that we’ll face during the row due to where our island is, which will hopefully give us an advantage as we get closer to home. Samara: Our first major row was in April, from Antigua to St Kitts. We set off at sunset and just got on with it, we knew we wanted to practice rowing at night as it is something we’ll face every day during the race so it was just one of those things we needed to do. We actually came to the UK in October whilst our boat was being upgraded and adjusted so we trained there as well; we did a 12 hour row on the River Crouch in Essex, which was a journey! Kevinia: We had the guidance and advice of the previous Antiguan teams and Eli Fuller has given a lot of his time to help prepare us as best as possible. But there’s a saying you hear a lot in the ocean rowing community and that’s that nothing can really prepare you for rowing an ocean. Christal: Like a lot of the foursomes we’re planning on having two team members at a time rowing 2 hours and then having 2 hours off. But in that ‘off’ time you have to do all of the other things that are needed; eating, trying to keep hygienic in the conditions, sleeping, navigating making water… its relentless. Kevinia: Staying hydrated will be key to be able to function and do everything that needs to be done. And we’ll keep morale up with our music. We’ve got a lot of gospel to keep us going and of course some Christmas songs! All expeditions are about endurance, how will you balance out the mental and physical demands? Christal: Our team spirit will keep us together and push us on. Elvira: And the meditation skills we learnt will be crucial to just re-setting and re-focussing when something doesn’t go to plan rather than getting stressed out. What will be the most challenging aspect of the race? Elvira: I think experiencing the sleep deprivation in full for the first time will be a challenge, you can’t really prepare for it or know how we’re going to handle things until we’re in that place. Samara: I’m going to miss having fresh food! All the food we eat whilst out there will be dehydrated, I can’t wait to have fresh fruit and vegetables when we get home. Christal: Sea sickness is another thing. We won’t know how it will fully affect us until we’re out there. It can be completely debilitating and has made many previous strong teams and team members retire. If we get it really bad, we’ll be too weak to carry on. Kevinia: And the calluses and blisters we’re going to get will be huge! I don’t think we’ll be able to avoid them but they’ll definitely make things more challenging as time goes on out there. Samara: We’ve got waterproof notebooks to record how we’re feeling and to help deal with our emotions. And to cheer ourselves up we have dehydrated mango we’ve brought from home and ginger for snacks. And playing our music nice and loud! Kevinia: The whole island knows about the race and will be there to support all the teams when they get in. What does achievement look like? Christal: For us, definitely winning. Kevinia: We’re going for the titles, we want to take the record for the fastest female four. Elvira: Even if it’s only beating it by a second, we’ll do what it takes!